Brett Gardner did something he hadn’t done since April 2012 last Friday: He started a game as the No. 9 hitter. With the Red Sox starting three lefties over the weekend — three tough lefties, at that (well, two tough lefties and David Price) — Aaron Boone went with Aaron Hicks in the leadoff spot and Gardner as the No. 9 hitter. They’ve been getting on base at the same clip, though Gardner has shown zero power against southpaws. His decline against lefties has been gradual whereas Hicks has been better against lefties (111 wRC+) than righties (86 wRC+) throughout his big league career. Give the guy who’s been more productive against lefties more at-bats against lefties. Nice and easy, right? That’s what Boone did. I didn’t see whether Gardner said anything about his temporary lineup demotion — he was back in the leadoff spot the last two nights — but I’d be shocked if Gardner was upset. Even if he wasn’t happy about being bumped down to ninth, Brett is not the kinda player to make waves about something like this. He’s a total team player who will do whatever. It’s good to have guys like that in the clubhouse. 1. The Yankees wouldn’t lose any plate discipline atop the lineup. One thing Gardner does better than just about anyone is grind out at-bats and make the pitcher work. Everyone remembers his 12-pitch battle with Cody Allen in Game Five of the ALDS last year, right? Well, not everyone remembers that it was Gardner’s second 12-pitch at-bat of the game. He had one against Andrew Miller (!) a few innings earlier. That’s Gardner, man. The next at-bat he gives away will be the first. There are 162 players with enough plate appearances to quality for the batting title, and only four of them have a lower chase rate than Hicks: Joey Votto (16.2%), Alex Bregman (17.7%), Mike Trout (18.4%), and Andrew McCutchen (18.8%). Gardner is tied for the 12th lowest chase rate (with Aaron Judge). The leadoff hitter’s job is to get on base for the middle of the lineup, first and foremost. Get on and let them drive you in. The leadoff hitter’s secondary role is working a long at-bat to tire the pitcher and give everyone a look at what he’s featuring. Hicks can certainly do that. 2. Gardner can be the second leadoff man. At least once Gary Sanchez returns. 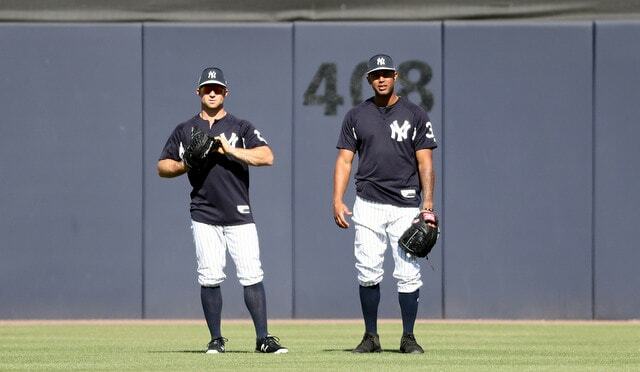 As long as Austin Romine and Kyle Higashioka are in the lineup, they should bat ninth, second leadoff hitter be damned. Those two are providing minimal offense and they should receive as few at-bats as possible. For the time being, the fill-in catchers should bat ninth. I don’t think that’s crazy at all. Once Sanchez returns, which should be right around the All-Star break, Boone can go back to his beloved second leadoff man lineup arrangement, and Gardner would be a perfect second leadoff guy. That’s because he’s a good first leadoff guy! It’s just that Hicks is better now. Moving Hicks to leadoff means getting him that extra at-bat to start the game, and, once the lineup turns over, Gardner is right where he’s been all year, setting the table for Judge & Co.
That’s what I’d like to see, but apparently batting righties or lefties back-to-back(-to-back) will cause a rip in the space-time continuum, so I’m next expecting this to happen. I’m not here to talk about the Nos. 2-8 hitters though. The point here is the Yankees would be better off with Hicks batting leadoff going forward because he’s a better hitter than Gardner at this point, and he does all those leadoff hitter things like work the count and run the bases well. Normally I’m not a lineup hawk. I’ve already wasted enough time and energy in my life worrying about something that doesn’t have a huge impact across the 162-game season. In one individual game though, the lineup can mean a lot, and we saw it Monday night. Torres was left on deck four times — four times! — because Higashioka’s lineup spot made the inning-ending out with men on base. Sigh. Hicks is showing that last year was no fluke. He’s getting on base and he’s hitting for power, plus he switch-hits and can work the count as well as just about anyone. He’s an ideal leadoff hitter, really. Gardner was that guy for a long time because he got on base a ton and could ambush the hell out of fastball, but he’s no longer that hitter. He still gets on base, sure, but the power’s not what it once was and the production against lefties isn’t what it once was either. The decision to bat Hicks leadoff and Gardner ninth against all those Red Sox lefties over the weekend was a good and smart move. It helped the Yankees score 19 runs in three games! (Despite being shut out in the middle game.) At this point, I don’t think that lineup arrangement should be limited to lefties. Hicks has been way too good this year to not bat him leadoff. He makes things happen, and, as the ninth place hitter, Gardner can still make things happen too.